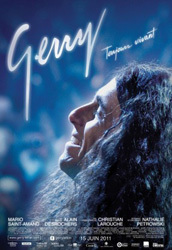 Synopsis: Gerry is a biographical film shot in Quebec about the Canadian rock singer Gerry Boulet (1946 – 1990) from Saint-Jean-sur-Richelieu, Quebec. Written by Natalie Petrowski and directed by Alain Desrochers. Gerry was filmed in Quebec; the live concert scene where Boulet and his band Offenbach perform at the Montreal Forum required the presence of 3000 spectators. I know very little about Gerry Boulet. I was in high school when his 1988 solo album came out, and I had no sense of perspective; I wondered who this goofy-looking guy was, but didn’t know just how important he was. In fact, I thought that he was new on the scene. Little did I know. I would find out many years later that he was the frontman for iconic Québec rock band Offenbach. One of my best friends is a huge fan and, in our early days, he would tell me about them from time to time. Personally, I couldn’t dig either Boulet’s solo work or his earlier efforts with his band; it was a style that I simply didn’t dig. And it was in Québécois. While my favourite composer is French, admittedly it’s a rare occasion for me to like a francophone musician. I find that the language has a limited ability to integrate with many musical genres; I frequently find that what was traditionally American music does not translate well in French (but when it does, I’m all over it! ). So my interest in this film was rather limited. The reason it was even on my radar is because I recently gave the blu-ray to my afore-mentioned friend on the 6-year anniversary of his sobriety and I promised to watch it with him. If not for this, it would have remained very low on my list of priorities. I’m glad that I did, though, because he was able to give me more of a historical perspective on what I was seeing on screen. He knew the whole back story (the fact that he read the Gerry Boulet biography beforehand helped, no doubt ). He also helped to fill in the blanks, because it turns out that many things were poorly established in the film, things that a novice wouldn’t have a clue about. -Offenbach’s dynamics should have been intensely driven by Gerry, but weren’t. In fact, we get the impression that some of the other guys are running the show, when the truth is that it all centered on Boulet. -Gerry’s tight relationship with his elder brother was barely apparent; they were inseparable for most of Boulet’s life. Gerry felt betrayed when his brother eventually decided to leave the band. They were not on speaking terms for years afterwards. -Boulet had a reputation as a non-stop womanizer, despite being married and having a son. This was barely hinted at in the film, with one love affair being established, but not much else. -Offenbach were also well-known as a party band. The unbelievably massive amount of drugs that they all took is stuff of legend. In the film, Boulet did cocaine towards the end of his life, but the decades-long drug intake wasn’t evident. -The scope of Offenbach’s musical output is hardly touched. In the film, we get a sense that they did 3 or 4 albums during the ’70s, but the reality is that they hammered out an incredible dozen (or so) in about 15 years!!! Why this impressive feat wasn’t touched on bewilders me. -Offenbach’s members gradually splintered off into competing band Corbeau, fronted by Marjo. The scorching rivalry between the two bands isn’t even alluded to. The duet that Boulet and Marjo did together on his second solo album is highlighted, but it’s not clear just how momentous this was after all those years of tension. There was a serious problem with the film’s sense of time. Locating scenes in history was almost impossible, aside from when there were changes in fashion and/or hair length – and even that stopped being especially noticeable after the story got out of the ’60s. At one point, the band goes to France, for what seems to be a summertime trip, and then we discover that they’d been there for almost 2 years! There weren’t even any changes in the seasons to indicate time lapse. ‘Gerry’ also abruptly threw us from one sequence to another without explanation or bridge; it was like a pastiche of short scenes tossed together linearly. Case-in-point, at the end of the France sequence, Gerry says that he wants to stay put, because he likes it there. Next scene: they’re back in Montreal. There is absolutely no explanation as to his change of heart, how long it took for this to happen, or any other context. Nothing. At least the main actor, Mario Saint-Amand looked the part. He was also skilled enough to sing for himself (for reasons unknown, they didn’t have him lip-synch to the original music… was it a rights issue? Was it because his speaking voice wouldn’t match the real Gerry Boulet’s vocals?). Unfortunately, he made the character into a caricature; his acting style reminded me of a cross between Yves Pelletier and Al Pacino – both skilled actors in their own right, but hardly masters of nuance. The rest of the cast was solid enough, even if no one delivered a stellar performance. Then again, the script didn’t make room for any emotional resonance in what should have been some pretty moving moments; it played like a b-grade TV movie or a straight-to-video production. So it didn’t allow the actors to really sink their teeth into their characters. They did well, perhaps even did their best, but there’s not much to be said beyond that. In the end, from a non-fan’s perspective, ‘Gerry’ would appear like a pretty basic film about a fairly plain and unexceptional band – one of many (I even read one review that questioned the need for a bio on Gerry Boulet!!! ). Thing is, Offenbach are a landmark in Québec music history and its members are rock icons there. As the heart of the band, Gerry Boulet absolutely deserved the screen treatment. It’s a real shame that the filmmakers weren’t able to convey this in their film, essentially watering down what should be an essential trip through the Québécois rock music wilderness into a pastiche of seemingly meaningless snippets. Nota bene: for non-fans, I’d give this film a 7.0. For fans, I’d give it a mere 6.5; it’s far too superficial for anything more.